Last Tuesday, Apple held a series of product unveilings at its headquarters in Cupertino, Calif. As you probably heard, it didn’t introduce the hotly anticipated iPhone 5, but the 4S which follows the “release and iterate” product cycle seen two years ago in the iPhone 3G and 3GS. Disappointment in the lack of a new body was tempered (for some) by a much faster A5 processor and a new 8 megapixel camera that shoots video in 1080P. 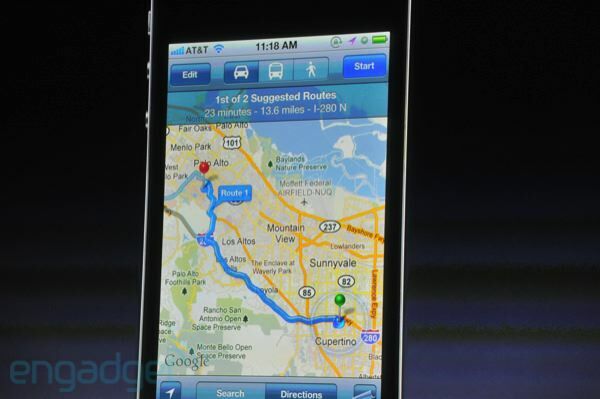 We also get a multi-carrier supported “world phone” and a flood of new software features in iOS5. But sticking out most was the integration of voice search, which will be deeply rooted in the iPhone 4S (something we saw coming 18 months ago). This builds on apple’s 2010 acquisition of voice search innovator Siri, and will carry the name Siri Personal Assistant (video here). But unlike its predecessor — a standalone third party app — deep integration at the OS level makes SPA more of an über-voice-search app. In other words, it ties in with all kinds of native capabilities and apps such as calendaring, SMS, alerts, browser and mapping. The latter pieces have clear implications for local search. 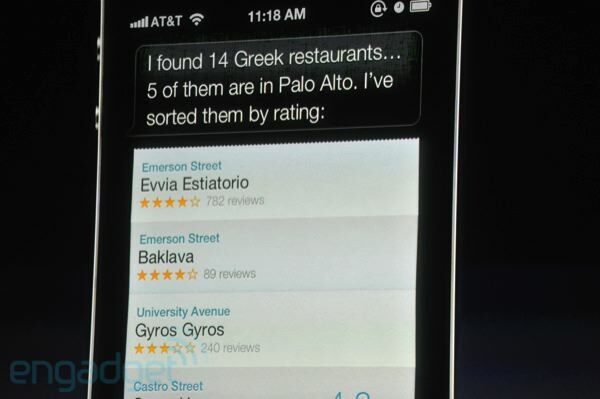 When searching for a Greek restaurant in Palo Alto for example, Siri detects the query then automatically identifies Yelp as the most relevant content source. Lots of other possibilities await — imagine OpenTable reservations synced with iOS’ calendar and prompted by voice. It will start with Apple’s tie-ins to Yelp, Google Maps and the browser, but will really blossom when baked into the SDK for third party app development. That doesn’t appear to be the case yet (I’m still investigating). But when it does happen, innovation will scale to the masses of iOS developers to do all kinds of cool things that follow the lead of what Apple has done natively in this first release. This will be both local and non-local, likely following the existing mobile search share for each. Google currently pegs local search on mobile devices at 40 percent (compared with 20 percent on the desktop). But mobile voice search could even skew more local because of the propensity to use voice when out and about and in “lean forward” mode where local commercial intent is high (think: driving, or walking through a busy commercial district). Further underscoring voice search’s growth, Google separately reports 25 percent of overall mobile searches are voice. This measures voice search within the browser and its iOS and Android apps. Overall voice search will only grow with Siri’s deeper integration in iOS. One question is whether Apple will begin to see this positioning as a way to seek a revenue share for generating leads to local businesses. For now it’s rather driving more search traffic to the Googles and Yelps of the world — apparently without compensation. It’s a different front end to the search process, and one which will drive incremental searches such as while jogging, driving or in bright light. This could end up being a valuable position. And like it did with iAd, Apple will monetize its role in increasingly “owning the user”. Further, if Siri is integrated with the SDK as speculated above, it will likewise scale voice searches to the point of being a greatly monetizable asset. Nowhere will this be more apparent than driving (literally in some cases) customers into local businesses. Until then, just think of it as a cool feature to sell more iPhones. And it is pretty damn cool (to be expected of Steve’s legacy). We’ll see where else it goes. Postscript: This article comes just days after Steve Jobs’ passing. Analyzing Apple’s latest achievement isn’t meant as any sign of disrespect at a time when more traditional tributes are being published. The opposite is intended: respect for his talents and influence in shaping (inventing) the post-PC world we’re entering. Michael will be moderating a panel about the future of the “check-in” featuring top executives from Foursquare, SCVNGR and goby at the Street Fight Summit on October 25th-26th in New York. Don’t miss your chance to mingle with the top minds in the industry. Click here for more details.